Dog Man meets Big Nate in HILO-the hilarious New York Times Bestselling GRAPHIC NOVEL SERIES kids love! "A Total BLAST," says the Miami Herald! Everyone's favorite space boy, Hilo, is just settling into life on earth (Bowling? Knock-knock jokes? OUTSTANDING!) when strange portals begin opening up all over town. And HOLY MACKEREL! Even STRANGER creatures are coming through them! 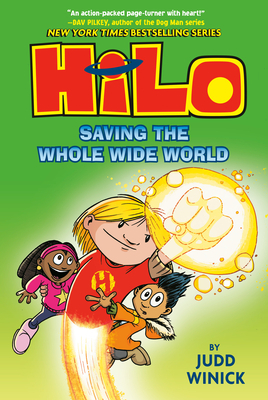 But it will take more than a GIANT MUTANT CHICKEN, A VIKING HIPPO, A MAGICAL WARRIOR CAT, or even a few MILLION KILLER VEGETABLES to stop Team Hilo . . . er, WON’T IT? Can Hilo, DJ, and GINA figure out how to send these creatures back to their worlds before they DESTROY the earth? * Children's Choice 5th-6th Grade Book of the Year! * Nominated for multiple State Awards—including the Pennsylvania's Young Reader's Choice Award! * An ILA-CBC Children's Choice! JUDD WINICK grew up on Long Island, where he spent countless hours doodling, reading X-Men comics and the newspaper strip Bloom County, and watching Looney Tunes. Today, Judd lives in San Francisco with his wife, Pam Ling; their two kids; and their cat, Chaka. When Judd isn't collecting far more action figures and vinyl toys than a normal adult, he is a screenwriter and an award-winning cartoonist. Judd has scripted issues of bestselling comic series, including Batman, Green Lantern, Green Arrow, Justice League, and Star Wars, and has also been head writer on the Hulu network’s animated series, The Awesomes. Judd also appeared as a cast member of MTV’s The Real World: San Francisco and is the author of the highly acclaimed graphic novel Pedro and Me, about his Real World roommate and friend, AIDS activist Pedro Zamora. Visit Judd and Hilo online at www.juddwinick.com or find him on Twitter at @JuddWinick.